The 4X4 ute production scene is starting to sound a bit like Days of Our Lives. Ending a decades-old and successful relationship in the 4X4 scene, General Motors (Holden) and Isuzu have decided to part ways in future utility endeavours, as their goals don’t see eye to eye any more. There doesn’t sound like there was a dumping from what we can tell, rather a mutual decision to stay just ‘friends’. Holden apparently wants to look at the top-end of the ute segment more seriously, with flashy, top-end flagship models. On the other hand, Isuzu is happy sitting somewhere in the middle of the pack in terms of bells, whistles and costs. It breaks what was a long term relationship for the two, dating back to the very first iterations of Jackeroo and Rodeo Holden 4X4s in Australia. Isuzu’s roots and progeny lie firmly in the bosom of sportscars: the Bellet and Gemini being some of the best known models. When GM took a big financial interest in Isuzu, the relationship began. The first offspring was the Isuzu LUV and Faster, direct descendants of Holden’s first Rodeo. It originally sported a 1.6 litre four-cylinder petrol motor of some 50kW and 110Nm. This was followed up by Isuzu’s C190, a four cylinder diesel that began Australia’s long love affair with Isuzu diesel powerplants. The love blossomed. In 1981, the Rodeo ute was joined by the Jackaroo wagon, a 4X4 that saw great success in Australia as a family wagon and weekend warrior. It was based directly on Isuzu’s Trooper/Bighorn wagon. By the time the late 80’s rolled around, both unit benefited from Isuzu’s 4JB1 and 4JB1-T powerplants, which were quite advanced for their day, and proved to be reliable and efficient long-term diesel powerplants. Nowadays, Holden’s Colorado (The Rodeo name is owned by Isuzu) sports a diesel engine from VM Motori; 2.8 litres of turbocharged and intercooled power, which is marketed as a ‘Duramax’. Isuzu, on the other hand, are running their own 3.0 litre 4JJ1-TCX powerplant. A lot of the engine down sizing comes down to meeting the European emissions. They have to develop entirely new engines ( 6 cylinder especially ), and make them fuel efficient and reliable longer than the warranty period. It’s all about marketing these days. 3.5 ton towing big nm of torque and sat Nav and Bluetooth . To the general consumer they are the big ticket items and they don’t care about the fact they a pour little 2.8 engine is being driven to its limit every day. I like Isuzu stuff it’s always been solid and reliable. Except for the jackaroo common rail. But it did teach Isuzu some valuable lessons that have made the later engines even better. As I mechanic I would be worried to own a new car once the warranty ran out and some of the cost involved in repairing them. Go the old 80 series cruiser. The last of the great trucks on the market. It would be nice if GMH came out and let the holden colarado owners why some of these colarados are using oil. It seems that not all these vehicles are using oil which says to me that there is a problem there but there trying to avoid fixing the oil usage problem. Can anyone shed a light on this?? My 2014 Colorado uses 200mls of oil every 1000km, I’ve had numerous consumption checks by Holden with me driving and lately the dealer kept it for 1000 plus Km and then told me it doesn’t burn oil. I have driven it for 4 years and 80,000km, but mysteriously I don’t know what I am talking about because the spec states that it can use 2ltrs every 10,000km and it is acceptable. There is an oil burning/disappearing problem, they even installed a shorter dip stick to try to hide the consumption, after every service the oil is filled at least 500mls over the add oil mark, just another of their slight of hand to hoodwink the owner. Prospective Colorado owners be aware. I had 3 Jackaroo’s. Loved the first 2. then bought the Common rail Diesel Version……. First engine lasted 120,000Km.TOTALLED. complete right off (told me they couldn’t tell me why it failed). The second engine lasted just over 100,000Km. and showed exactly the same signs (got rid of it). That was despite the Techs and the Holden dealership saying…”no problem they fixed the issues on this version”….Yeh right!! Never buy another Holden or Isuzu. Love my Toyota 4×4’s though. yes sir ree!! My roots are with the 6 cylinder 4 litre turbo diesel Toyota 1986 vintage with only the clock that could be considered electonic, although it wont win any fuel economy or speed contests it does however get the job done. I’m constantly in awe of the modern 4×4 diesels (and petrol 4×4) being strandard because of a failed computer read, that’s OK if the dealership is within spitting distance of the failure point but is of little consequence if its a bit further. I believe that these type vehicles should be bullet proof in that the reliability factor should account for conditions and remoteness that 10% of these vehicles face – the reliance on computerisation for non drive components should at the very least be able to be sidelined rather than immobilising the vehicle. Yes the old bus is now 30 years old and sooner or later it will be replaced. so far the modern 4×4 wins on looks and creature comforts but falls dismally short of confidence they will get me home. 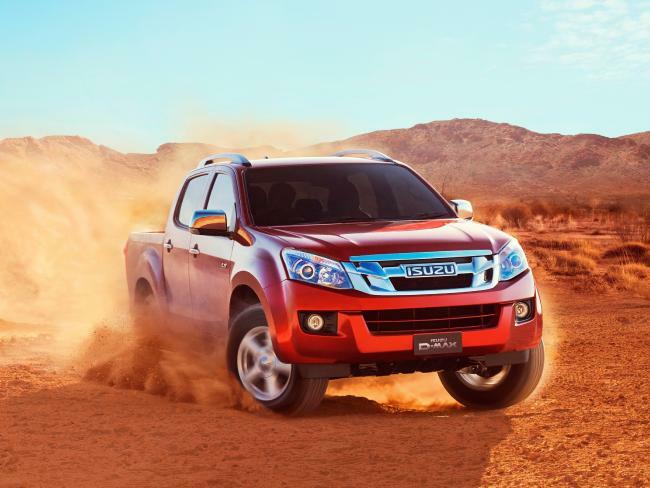 Good move by Isuzu that’s been coming since the GFC and GMs resultant financial troubles. I just hope Isuzu continue to manage their engagement in the hi tech complexity push infecting the ute market these days. Let’s hope too that ute manufacturers provide a City version and a Country version of their offerings. You know, simple things like suspension fit for purpose! A proven truck based engine instead of modified car offerings, exiting the rediculous Torque War! I want to know I won’t be stranded out in the scrub because an auto handbrake or some other irreparable gismo packs it in. You soon discover that no mechanic within hundreds of KMs wants to even look under the bonnet. (I once owned a Disco 3, Say no more). Allthough fuel consumption is a big deal in today’s market as well as polution control i feel going with the more out of less attitude like some other manufacturers out there is not the right way to go .! Most people tow or use a dual cab for work family & play & require an engine that has good fuel economy decent torque & power what you need to trump the market is s good 6 cylinder turbo diesel that comes in a manual & auto & poss also in a family wagon 7 seater . The 5 cyl diesel has great torque and an impressive kw output . So come on guys lets see an awesome v6 twin turbo diesel with class leading power & yes a clutch availability . The list is getting very small ! If they can make a ute which can tow 3500 kg whilst also having a one ton payload that would cream the market. Basically the ute would need a GCM of at least 6800kgs. This is what people are wanting!